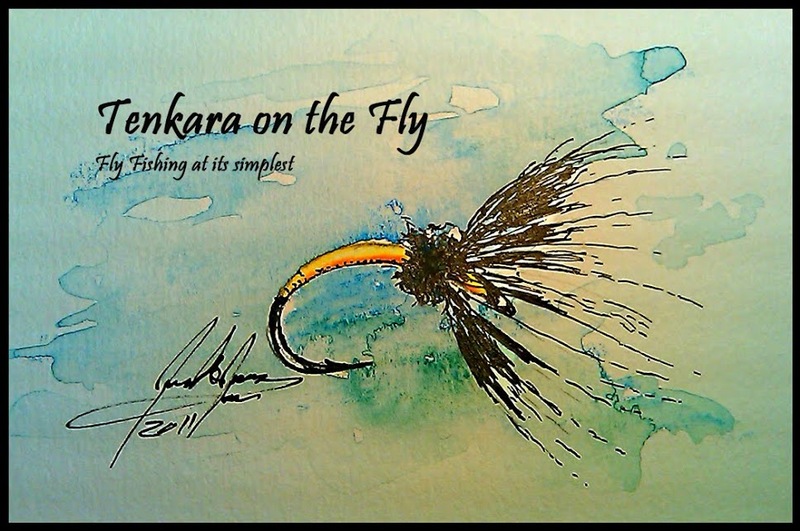 Ok, so I have a bit of tenkara and fly fishing "swag" that I would like to give away to my blog followers as a "Thank You". All of the stuff in the picture will be given away randomly to 15 lucky swag winners. Each entry will be assigned an entry a number and I will then use the online random number generator to pick the winners. Bonus: You will receive an additional entry for following the blog through Google Friend Connect (box on the lower right on the front page of the blog). I will post the winners on this blog post as an update in the evening of October 5th. Please come back and check to see whether you have won. If you see your name, please email me (email will be published with the update of the winners) with your pick of 3 choices of which you will receive one - note that you will receive one square Tenkara on the Fly sticker in any case if you are a winner. The swag will be allocated on a first come/first serve basis, so whoever emails me back first will have dibs. Any questions, please ask away in the "comments" below. Everybody who commented on this blog post is a winner! You will receive 1 Tenkara on the Fly sticker plus 1 item of the list above. Winners: please email me at "giveaway at tenkaraonthefly dot net" with a few choices (prioritized) of what swag you are interested in plus your mailing address. I will fill requests on a "first come first serve" basis - whoever replies back first has dibs. Thanks for participating and tight lines!